These are the ones that really stand out from the crowd. Taken off of brand new Slant back "12-02" Vepr 12 Shotguns. Picked for really nice burl/stripes/marbling and unique grains. PayPal FRIENDS AND FAMILY. All prices include shipping! PLEASE POST HERE AND PM ME AS WELL IF YOU ARE A BUYER! #2 - $52 Blondie - A true rarity. An actual blonde takeoff from a Vepr 12 shotgun. The only one I've seen so far. Dude... those prices are stupid! That's a crazy low! 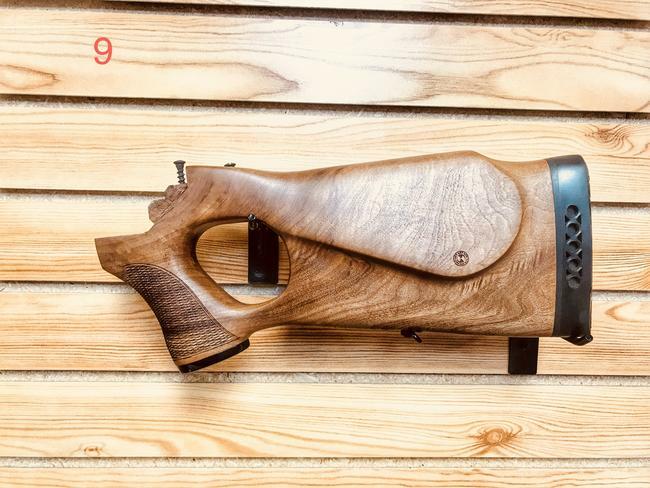 Gotta be honest, I try my best to HATE wood on guns like these, but some of that grain pattern is AMAZING. That being said, mine isn't a slant-back, so they're all useless to me. I find them to be mesmerizing myself bob. Most of the stocks that come on these guns are pretty blah, and then you get some absolute knockouts like these. If I had enough $$ and enough guns to put them on I’d buy them all myself. I’m reaaaaaly tempted to keep the blonde one and convert into a Vepr shotgun Tabuk clone with sniper cutout and cheek pad, blonde RPK handgaurd set, long slotted flash hider, ALG trigger, and custom arms grip. Cool. Lemme know if you ever get any 'squares' in.